I have to admit, I will try to save money anywhere that I possibly can! About a year ago, the Lord blessed us with a big beautiful new home. We moved from a 2 bedroom mobile home to a 4 bedroom 3 bath with living room, family room AND bonus room! 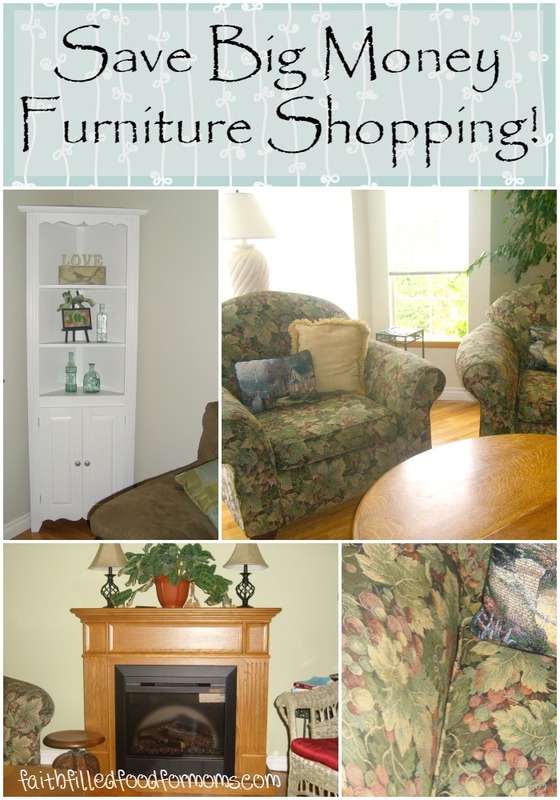 It was so hard for me to drag my old furniture into this beautiful home. I know, I know I should be thankful…and I AM:) But I still wanted some new furniture! Before we moved we got rid of some of our old furniture so when we moved in the new house it was pretty bare. What we did have was minimal. We really could not afford to go to a furniture store and go furniture shopping. What I saw at garage sales I wasn’t too happy with. So a friend of mine suggested…Craigslist! It made me nervous, but I though why not try it out. I wanted to show you some of my favorite and best deals! I also thought that I would fill you in on how I decide whether or not what I want to buy is a real bargain! I paid $20 for that electric fireplace! It works perfectly, is real wood and has not one scratch on it:). I paid $15 for the white cabinet..woohoo. For the chairs I paid a total of $35. I have many more, but these are really some of my best deals! I go online and check out retail prices for the things that I want to buy. I decide how much $$ I am willing to spend on that item. Take your time looking, I looked for almost 8 months for that electric fireplace. They are worth about $400, but I had a budget to stick to and I was not willing to pay more than $25. (I know, I’m cheap) I saw many of these fireplaces for $50 and was tempted to buy. My patience was rewarded. So be patient, take time and stick to your budget. Make sure what you are buying comes from a non-smoking, pet free or clean pet home! I hope this will not be offensive, but some smells are very hard to get rid of. I learned this the hard way. My first purchase on Craigslist was a set of couches that ended up needing to be badly cleaned. The previous owners let there dogs sleep on them. It took me 3 weeks of scrubbing almost daily to get rid of the smell and dirt. (it was dark when we bought them) Well I didn’t even THINK about other people and there pets! Don’t get me wrong, I love pets. We have a dog and two cats, but remember, others may not have the same idea of cleanliness as you do. Don’t buy in the dark! That goes without saying if you read the above. It is also not safe unless you have someone with you. If it is something portable that fits easily in your vehicle – meet them somewhere public! A store parking lot or something. I know it seems funny, but for safety reasons it is best. Most people I have bought from prefer this public meeting anyway. It’s ok to NOT buy something. If when you get to a persons home or meet them and the item is just not what you are looking for. I’m afraid this is the hard part of bargain hunting on Craigslist. If something seems FLAKY…IT IS! So what are some of your best deals?